Buy Latinx Geeks a Coffee. ko-fi.com/latinxgeeks - Ko-fi ❤️ Where creators get paid by fans, with a 'Buy Me a Coffee' button. Hi everyone! Thank you for supporting Latinx Geeks on Ko-fi! 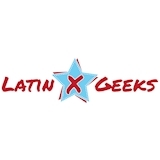 I created Latinx Geeks in 2015 because I saw a gap in the geek community. I didn't see Latinxs represented like I felt they should be and while sitting in the Geeks of Color NYCC panel I decided "Hey I can do this!" So I started Latinx Geeks and have done my best to run it and pay for the costs by myself. Now over two years later the site has grown and I want to be able to offer more services which is where your support comes in. Secured Payments. Support goes to Latinx Geeks's account. Upgrade Latinx Geeks to a yearly Gold Membership with a one-time payment.